The Albany Police Department will be sold to Linn County (bike not included). That was quick! 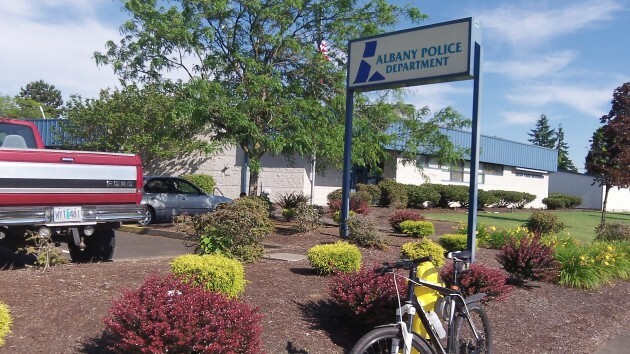 The Albany City Council Wednesday voted unanimously to accept an offer by Linn County to buy the city’s police station on Jackson Street as well as the city-owned property where the Oregon National Guard has its armory. The quick deal came as a surprise, at least to me. It was apparently worked out, with the county commissioners’ OK, by county administrator Ralph Wyatt and City Manager Wes Hare. Hare presented the offer to the council Wednesday night in an executive session. The council reopened its regular meeting and authorized Hare to finalize the details. City Attorney Jim Delapoer said he would look into whether a public hearing is required before city property is sold, but he didn’t think so. Wyatt wrote that the offered price was discounted to account for continued use of the station by the police department until its planned headquarters on Pacific Boulevard is ready, and because the county won’t have use of the armory property until and unless the Guard moves. The Guard is using the property under a long-term lease from the city at $1 a year, but the state has talked about eventually making other plans, perhaps to consolidate Guard units. Council members speculated that Linn County may eventually want to use the armory property in conjunction with the nearby Expo Center, a development the city would welcome. As for the police station, the county has announced no definite plans, but its possible use in conjunction with the nearby county jail and sheriff’s office has been talked about for years. POSTSCRIPT: Commissioner Roger Nyquist says the county hopes to use the APD building to house programs for persons transitioning from jail to freedom. Also, state Parole and Probation may move there. (The present parole and probation offices are in the state building on Lyon Street, the former downtown Sears store.) As for the armory, the Guard is hoping for a new armory on county-owned property near I-5 and Highway 34, leaving the current site on Knox Butte Road to be used in conjunction with the county’s Expo Center. Public property staying in public hands at a fair but discounted value. Too bad the Congress can’t solve things as amicably as the City and County. Will the council keep its word? Oh, you mean the bond measure where the city got more money than they asked for because the private sector wanted those bonds so bad they bid up the price they were willing to pay. You know, the city that got all those awards for financial management for what, 25+ years now. And of course you know that the bond rate levy was fixed by the ballot measure the citizens approved. The same one that you worked so hard to kill, only to be sent packing by the people of Albany. Certainly you remember trying to torpedo the city manager by filing a protest with the state, only to have the Secretary of State reject all your unfounded allegations. The Council has proved their mettle in the management of the city. A little bit “too wrapped up”, Bob? The council has said they were going to do one thing with money, then not kept their word in the past. There IS a precedent there. You again take an adversary’s comment and make way too much of it. Maybe you should sample some of your homebrew and calm down. You aren’t even a resident of Albany and have no skin in this game. So it’s not clear how a personal attack against a resident helps your argument. Come to think of it, what exactly is the substance of your argument? Will the council honor their word and use the proceeds of the sale to pay down the cost of the bond measure? The proceeds from the sale of the PD – that definitely gets my support. I believe the proceeds from the sale of the armory should go into the totally depleted equipment reserves for the FD.